It's a time of spiritual rebirth. A beautiful, inspiring and empowering new moon in Scorpio takes place on November the 7th. The new moon is the time when the Sun and the Moon come together at the same area of the sky as they cycle the celestial dome, and their meeting marks a reset in the ever-changing influx of the lunar and solar energies. What we intuitively need (the Moon) is now made conscious for our zodiac signs, and we can use our creative energy (the Sun) to initiate, make a new start, or to refresh actions or relationships. When the Sun is in Scorpio, our will is strengthened, desires are deep, and everything takes on an existential quality. All issues are approached with a “matter of life and death” attitude. They are important, because we ourselves feel important and we can display intensity of will. The Moon in Scorpio is intense emotions, buried emotions, taboo emotions. It is supercharged psychological intensity, urges of the psyche powerful enough to transform. The lunar emotional depth, when combined with the solar strong will, make every new moon in Scorpio a potential powerhouse of renewed emotional stamina. Each new moon in Scorpio is sheer determination to go after our desires and it may act as a boost for transformation in the area of life denoted by the house in which it falls on our personal horoscope. These qualities make this specific new moon to be exactly what we need after the three difficult moons that have preceded it. At last, after a period when we had to cope with difficult emotions and sudden changes, we can now regain our power and renew our emotional strength. The power surge that this lunation gives is amplified by the fact that the Sun and the Moon are not only in Scorpio, but also in a sextile aspect to Pluto, the sign’s ruler and ruler of this new moon. The sextile of Sun to Pluto brings opportunities for empowerment on personal and professional level. It is an aspect that means that we now can fulfill desires with little effort or we can join our power with that of persons of authority or financial status to achieve more. We are focused, determined and concentrated, and there is no need to force or manipulate matters or persons. At the same time, the Moon is in a sextile aspect to Pluto. Any intense feelings of the previous period were a necessary cleaning of the dark places of the soul. And though this may have been a painful or exhausting process, it made the necessary room for us, and we can now again feel how strong we can be. We have emotional control and we are again able to share deeply and intensely. No more being recipients of emotional blackmail or feeling vulnerable, but ready to trust again. The new moon is also in a trine aspect to the planet Neptune in the sign of Pisces. This aspect makes us creative, fills us with inspiration, and make us easily sense the ambient vibes. It can work marvels in our relationships. Now we are in touch with our most spiritual and we care for what is cherished in our hearts. We see the other’s point of view, we walk in their shoes and we can comfort or show that we really understand. This new moon in Scorpio is acute perceptiveness that brings renewed spiritual connection (Neptune in Pisces) and regained psychological empowerment (Pluto in Capricorn). It makes us ponder deeply on those issues relating to the area of life that it falls on in our personal horoscope, brings intuitive understanding, makes us feel empowered, and helps with closure of the past and moving on to new territory. Why is that? Why this new moon has such an ending quality and at the same time is a new beginning? Why does this new moon work as a closure or as the final paragraph before moving on to the next chapter? If we examine the chart of the new moon, we see that Jupiter, Uranus and the Nodal Axis are all situated at 29th degree. This degree in astrology is one of the critical degrees and is usually connected with endings. In the chart of this new moon, Jupiter is about to move from Scorpio into Sagittarius. It is now time to move on from the truth of the soul to the truth of the world, expanding outwardly and not inwardly. But before doing so we have to face for one last time our deepest emotions, our very truth. At the same time, Uranus, as it moves retrograde, is on the 29th last degree of Aries sign. Issues relating to how we can embrace freedom and individuality without being self-centered and disruptive to our relations are again of concern. 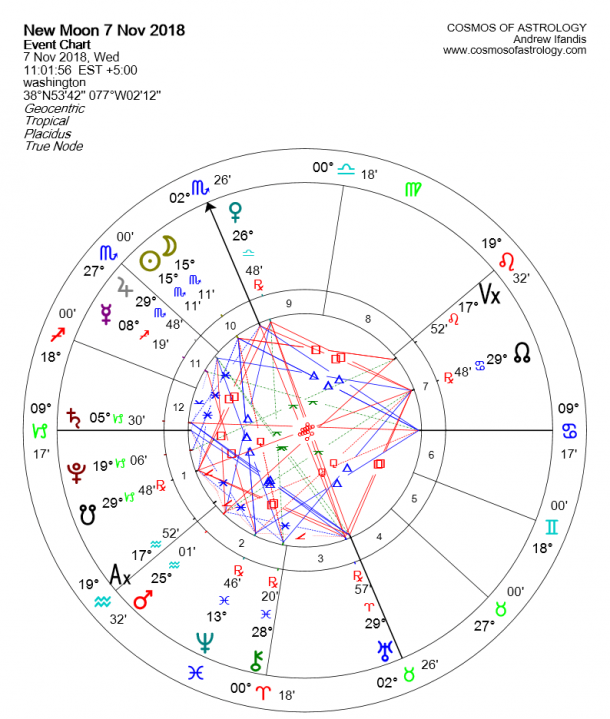 In addition to that, Venus is separating from an opposition to Uranus, an aspect that was exact one week before the new moon, and that has created tensions, or to some of us considerations to ending relations or to others even actual breakups. The Lunar Nodes are also at 29°57’, critical degrees, as they have just entered into the Capricorn–Cancer axis something that denotes a shifting of energy that will bring the emphasis on a totally new area of life (chapter) for our personal horoscope for the next 1.5 years. This repetition of the 29th degrees gives this ending quality to this new moon. Accompanying this feeling, Chiron the wounded healer is at 28° 20’ of Pisces. From there it makes a trine aspect to Jupiter and a sextile and trine aspect to the Lunar Nodes, infusing the lunation with healing energy. Jupiter is also trine–sextile to the Nodes while Uranus is in a tight square to them at the same time. The one planet bringing sudden changes, the other bringing advancement and luck. We can now see how the evolutionary path of the Nodes will lead to a new chapter. Inevitable change and disruption of our security was necessary before us moving into to a whole new territory that has a promise of optimism and expansion. The new will come after having first made closure with the past. This is a necessary process for us, and we have to move on either with our relations re-invigorated or with a new version of our empowered self. This new moon in Scorpio inspires and moves us within higher frequencies of spiritual rebirth. It is either a renewal of the value that we receive from others or a renewal of our own self. This article was originally published at Cosmos of Astrology. Reprinted with permission from the author.